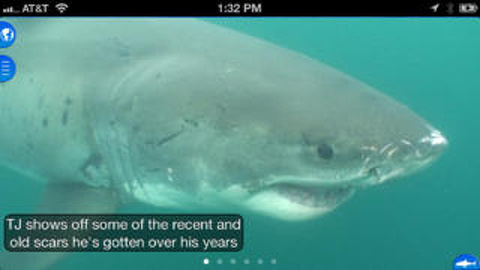 The Shark Net app for iPhone, iPad, and iPod touch will have you and your kids hooked from the start. It’s not very often you’re genuinely excited to download an app, but this one is fun for the whole family. My family and I were first introduced to the app during our visit to the Monterey Bay Aquarium in California. A biologist explained that current navigation technology allows researchers to track the coastal migration patterns of some individual great white sharks. This app uploads the location data so you can see where the sharks have been. So cool. For a nation that celebrates Shark Week and has made the “Sharknado” movie an epic success, this app has wide appeal. Like people in your social network, each of the Monterey Sharks has their own profile complete with head-shots. Sicklefin, Pincher and Little John are just a few of the sharks that researchers track. Bios read like a dating site, with the length and weight of the sharks prominently displayed. (I could swear that Pincher’s profile also mentioned his love of piña coladas and dancing in the rain.) Really, though, the detailed profiles make it feel like these sharks are your family. I imagined that with this app you would be able to locate a Monterrey shark in the ocean as easily you can locate your friends’ whereabouts on Facebook. I expected it to show me in real time where all the sharks were as they cruised up and down the west coast from Washington to Southern Mexico. In reality, the tracking technology does not provide 24/7 shark-monitoring. In fact, the shark locations can only be uploaded to the app if a shark swims close enough to one of several computer-buoys installed by biologists along the coast. 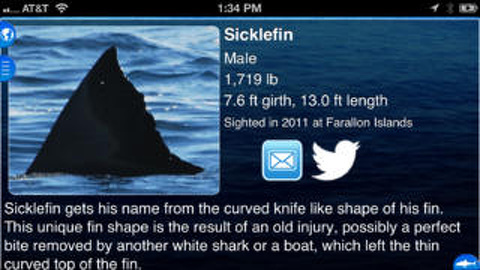 AppSafari review of Shark Net – Predators of the Blue Serengeti was written by Stephanie Quinlan on February 12th, 2014 and categorized under App Store, Education, iPad apps, Reference, Universal, Utilities. Page viewed 4111 times, 1 so far today. Need help on using these apps? Please read the Help Page. This is a good app, but get boring quickly!